In “Dark Alleys” I needed a name for the boy next door to one of the new main characters. How hard can it be to come up with a boy’s name? Not hard at all. I narrowed it down to Billy or Jimmy and decided on Jimmy. But I also liked Billy, so halfway through the book his name changed to Billy. That was caught by one of my “first readers”. I kept Jimmy. 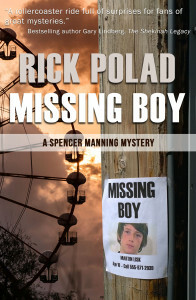 The latest book, “Missing Boy”, is about… well, you figure it out! But there are many boys in the book so I needed several names and resurrected Billy for one of them, the son of a neighbor across from Spencer’s new office. But I guess I didn’t like Billy as well as I thought because somewhere along the way I changed it to Bobby. I also needed a new name I had not used in any of the books for the main missing boy and, after some searching, decided on Martin. After the book was published it was pointed out to me that Marty was the name of the little girl who Spencer went to work for in “Change of Address”. Not a disaster, but interesting how names get stuck in my head. So… what’s in a name? It’s not as easy as you would think. I now keep a sheet of paper with just the character names and constantly refer to it to check continuity. But Spencer and Stosh and Rosie aren’t on the list. I often wonder what’s happening to my brain cells, but I still have enough left to remember my main characters!